Do you love Oberlin and its history and want to help share it with others? Consider becoming an Oberlin Heritage Center volunteer docent - a great way to learn more about Oberlin and its unique history! Talk to Museum Education and Tour Coordinator Liz Schultz (tourinfo@oberlinheritage.org) and make arrangements to take a complimentary tour to see whether becoming a volunteer docent or history walk guide is your "cup of tea" before signing up for a docent training workshop. We ask docents to commit to leading at least four tours per year. Our docent team is a fun and diverse group of all ages and backgrounds that meets periodically for informational gatherings, field trips, and more. All of the training workshops begin at the Monroe House. To sign up, visit www.oberlinheritage.org or contact Liz at (440) 774-1700 or tourinfo@oberlinheritage.org. April 28 (Sunday, 1-4 p.m.) History Walk Docent Training: Scholars & Settlers. 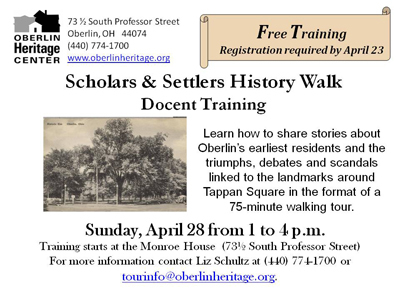 Learn how to present stories (in the format of a 75-minute walking tour) about Oberlin's earliest residents and the triumphs, debates and scandals linked to the landmarks around Tappan Square. Register by April 23.